Each version kept its own set of notes, which were printed in the left and right margins of the page. Notes for Beza's translation — in the left margin (and extending into the bottom margin) — were considerably more extensive than those in Tremellius' version. See at the bottom right of this page, in small letters — 11 Et. This duplicated the first word on the next page — Verse 11, which begins with the Latin word "Et" ("And" in English). You find this sort of thing in almost all 16th Century books. It's purpose was to let the reader know the first words on the next page. This was supposedly helpful when reading the text aloud. It eventually fell into disuse by the mid 1600's. You really don't need to know Latin to see that this page shows the start of the book of Mark. 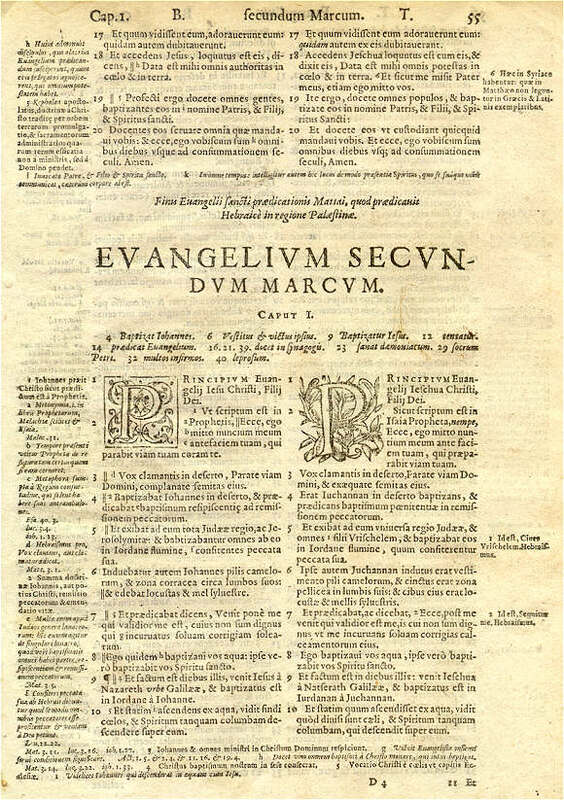 It says "EVANGELIVM SECVNDVM MARCVM" — (The Second Evangelist, Mark). [Old Romans typically didn't use the letter "U", so a "V" was used instead.] Check out the Closeup View for a better look at differences in the text.